Have you ever met a dietitian that would tell you it’s okay to eat chips for breakfast? Well, this dietitian is telling you just that and I’m going to share with you why I believe all foods fit, including chips, to start the day. I work with a lot of patients whose doctors rattle off a list of foods they should “never” eat and foods that are “bad” no matter when or how they are eaten. While I do discuss the impact of excessive amounts of added sugars with my patients with diabetes, I also discuss with them the many ways to include other forms of carbohydrates (which ultimately turn into sugar) in a mindful and healthy way that doesn’t lead to a cycle of restriction and then overeating. Let’s take chips, for example. If a patient were to walk in munching on a bag of Tostito’s flour tortilla chips, rather than scold them for having a food that will spike their blood sugars, frankly, quite high and rather quickly, I use this as an opportunity to first do a little digging as to WHY they chose that snack, and then secondly maybe we do an educational activity investigating the nutrition label. This isn’t only a practice I recommend for my patients living with diabetes- it’s a balance I believe we can all find! Yes, there’s going to be some times where the classic chip is the only thing you want, but I can bet that discovering a healthy alternative that’s just as tasty would be a welcome addition to your way of eating. I’m walking the talk and putting this healthful balance into action with these breakfast chilaquiles made with Beanfields Snacks chips. They graciously sent me a care package of some products to try and I am totally digging these plant-based, vegan snacks. The first two ingredients are the beans, which is why the fiber and protein content is high and something I can get on board with, including at breakfast! A chip with more fiber and protein is still going to cause a rise in my blood sugar (thanks for the energy!) but it will be a slower rise and more sustained energy release than its processed flour counterpart. 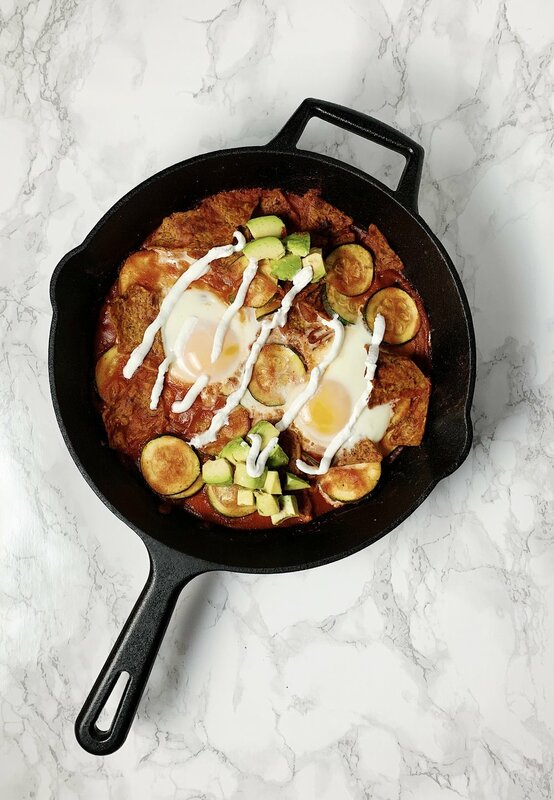 This dish takes minimal ingredients and time, so it could be made for a weekday morning, but I dug into this skillet on a slow morning at home. I made this a solo breakfast, but you can easily double the recipe and make it for you and your boo. I hope you find time to make this healthy, tasty skillet! To a heated cast iron skillet, add sliced zucchini and a 1/4 cup of water. Cook zucchini until starting to soften and water evaporates. Then add red onions and avocado oil. Stir and sauce until starting to brown. Pour in tomato sauce and add chips. Using tongs, stir everything together to coat chips in sauce. Make 2 wells in the sauce and crack an egg into each space. Slide skillet under the broiler and cook until egg whites are set and yolks are cooked to your liking. Remove from under broiler and top with a drizzle of plain greek yogurt (or shower of cotija cheese) and avocado. Note: I did not receive any financial compensation for this post. I just really love the Beanfields brand and want to spread the word!